Once you have done sightseeing of Dubrovnik, you should make an escape to the nearby Elaphite islands. This archipelago is situated to the northwest of Dubrovnik and consists of 13 islands of which are only 3 inhabited. Lopud, Kolocep and Sipan are popular destinations for a day trip from Dubrovnik. Islands with picturesque villages, citrus gardens, old churches and pine and olive forests are ideal for spending a relaxed time. The Elaphite islands are linked by boat to Dubrovnik port. There are several Jadrolinija ferries each way every day making it easy to do a day trip. Boats depart from Gruz port and tickets can be bought from nearby Jadrolinija office or online. First island is Kolocep - only 20 minutes by boat from Dubrovnik. The most of the island is covered with pine forest, olive groves and citruses. There are only 2 settlement on the island each with its own sandy beach. 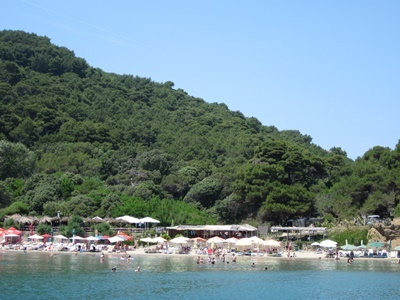 Next island is Lopud which is the most popular among Elaphite islands due to its beautiful sandy beach called Sunj. It is composed of fine, white sand and is ideal for swimming, sunbathing and summer sports. Jadrolinija's boat will drop you off at the port of Lopud which has a number of cafés, restaurants and hotels. Sunj beach is situated on the opposite side of the island and can be reached in half an hour walk. The last island is Sipan which is the largest one. The main port is Sudjurad which is connected by road to Sipanska Luka. There are several churches on the island, including the 11th century St Peter's church and the Church of the Holy Spirit which was built in 1569. Some of the Dubrovnik aristocracy built their summer houses on Sipan. On Sipan you will find great restaurants offering tasty sea-food dishes. Sipan can also be reached by GV catamaran which operates year-round. There is also daily Jadrolinija's car ferry to Sudjuradj which take 1 hours and 15 minutes from Dubrovnik. For a great day out take one of many available organized boat tours to the Elaphites. On these tours you will explore each of the Elaphite islands (Kolocep, Lopud, Sipan) in one day. Several agencies offer this kind of tours but the most popular are trips onboard "Karaka" and "Tirena" galleons. On these tours you will have chance to enjoy relaxed island atmosphere, walk through pine forests, explore old churches and finally swim in a crystal clear sea and sunbath on the beautiful sandy beaches. The lunch which consists of the fish and sea-food is served onboard the ship. Sailing tours to the Elaphites are the best way to spend hot summer days in Croatia. Tours are available from May until October. Taking a private boat trip to the Elaphites would be the highlight of your Dubrovnik summer holidays. You will enjoy while exploring each of the three islands in the Southern Dalmatia. Your skipper will take you to the most attractive spots. You will have opportunity to swim and snorkel in secluded bays or just relax on hidden island beaches. These trips are available as a half-day and full-day option. If you like to be active then sea-kayaking is a great ways to explore the Elaphite islands. You will have a great time while paddling along the islands and exploring stunning rock formations, hidden beaches and other secret spots along the islands. You will have time to swim, snorkel as well as explore islands on foot. Tours usually include lunch which is ideal opportunity to taste local cuisine. Departing point of tour is Gruz port in Dubrovnik from where you and your group takes a local ferry to Lopud island. Besides tours that include only kayaking there is also tours that combine this activity with cycling on the island of Sipan.